Mexican Hot Chocolate is even better than traditional hot chocolate. It’s just as creamy and chocolatey, but full of even better flavor! It’s no secret that I love Mexican food. I love all the flavors and spices in traditional Mexican cooking and Tex-Mex cooking too. From appetizers and entrees to desserts, all you have to do is throw “Mexican” in the name and I’m already a fan. It turns out, I’m even a fan of Mexican beverages! What is Mexican Hot Chocolate? Mexican hot chocolate is, in many ways, like the hot chocolate you already know. 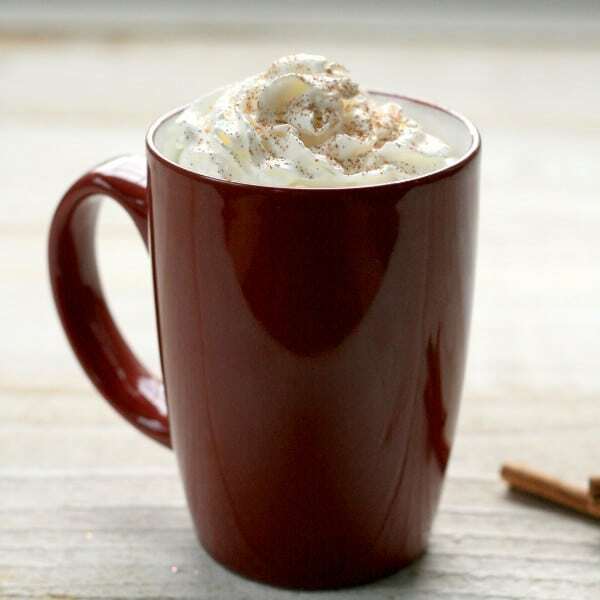 It’s a delicious, creamy chocolate hot beverage. What makes Mexican hot chocolate distinctive is the addition of a few spices that add a whole new flavor dimension to this tasty drink. 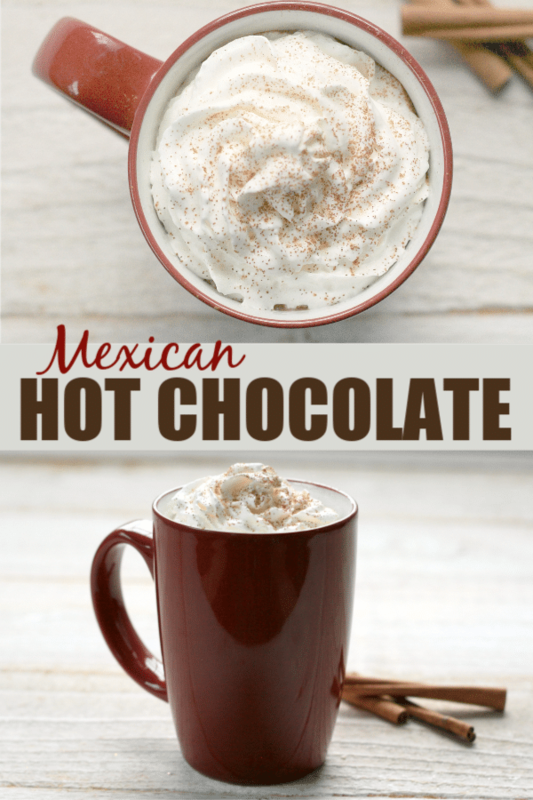 If you’re looking for an extra dose of flavor in your hot chocolate, then Mexican hot chocolate might be for you! So what makes Mexican hot chocolate special? Cinnamon, nutmeg and chili powder. 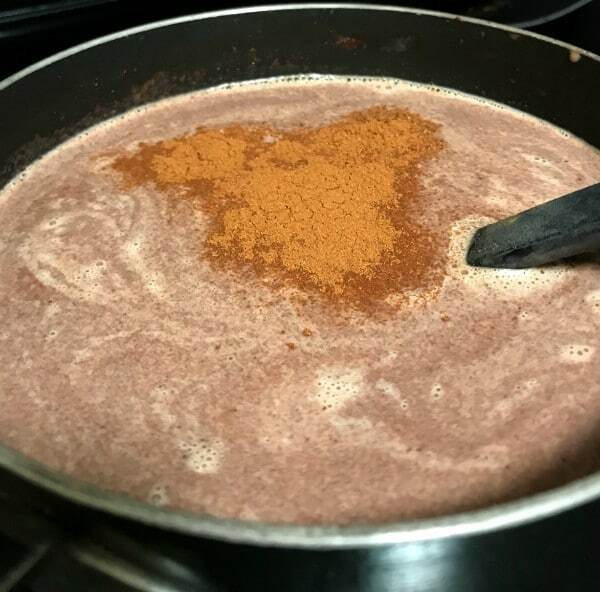 And then we’ll add some spices that will turn this ordinary hot chocolate into Mexican Hot Chocolate. 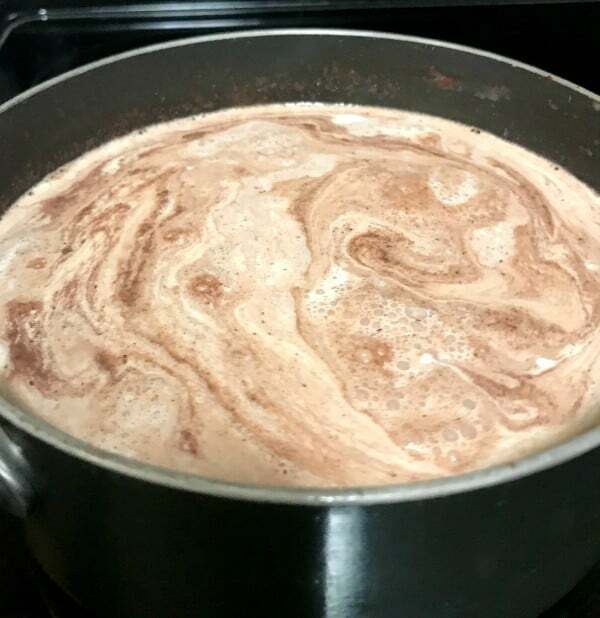 It’s not hard to make Mexican hot chocolate. In fact, it’s as easy as 1-2-3! First, we need to melt the chocolate. To do this, we combine it with milk in a saucepan and cook it over medium-low heat. It’s tempting to increase the heat to melt the chocolate faster, but don’t do it. If the chocolate gets too hot, it will harden. Melt it slowly and stir continuously during the process. Once the chocolate is completely melted, we can crank the heat up to medium. Add whipping cream, cinnamon, nutmeg, and chili powder. Simmer for 5 minutes or until desired thickness is achieved, stirring occasionally to prevent a film from developing and to keep it from sticking to the pan. 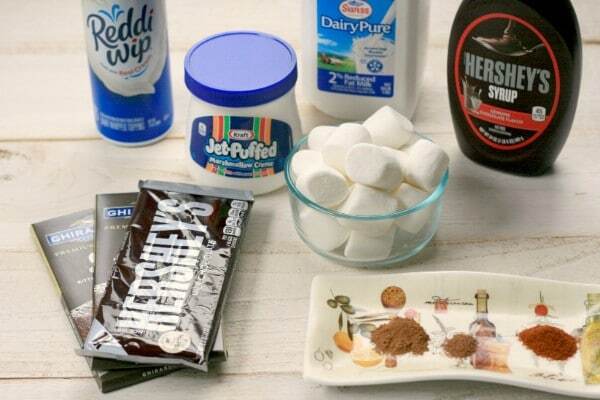 Now, you just need to pour into mugs and top with any toppings you want. 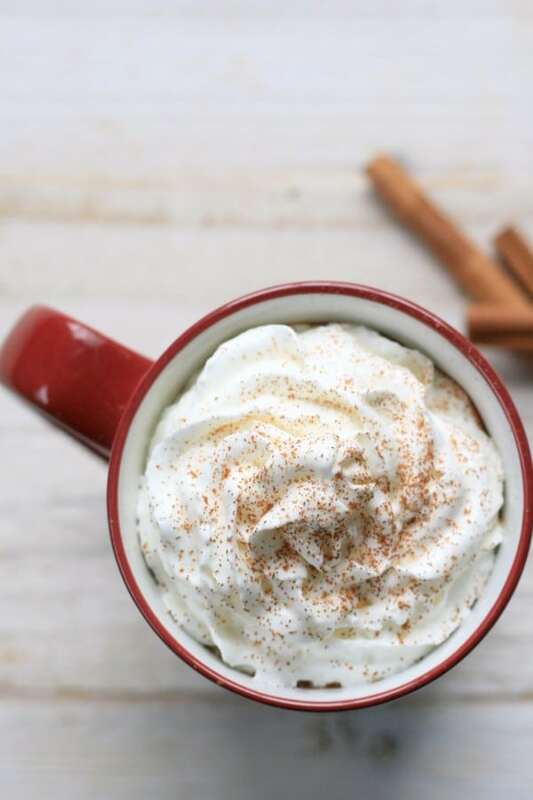 Personally, I like it with whipped cream and an extra sprinkle of cinnamon. Want to print off the recipe instead of all that scrolling? Just click the print button in the recipe card below. 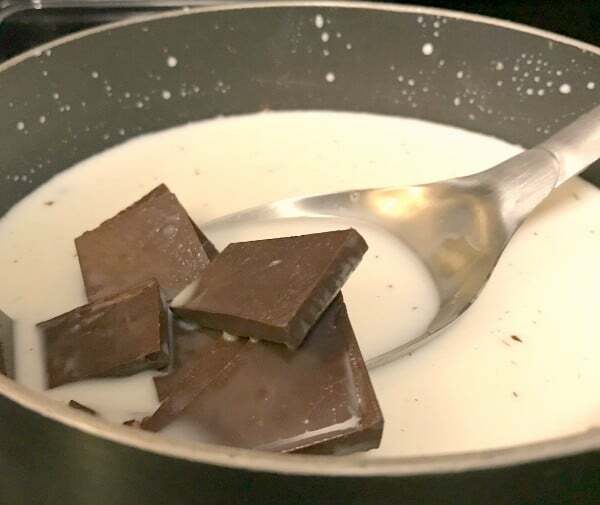 Combine milk and chocolate in a saucepan over medium-low heat (this is a slow process and cannot be rushed or the chocolate will seize up), stir continuously. 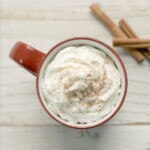 Once chocolate is fully melted, increase heat to medium and add whipping cream, cinnamon, nutmeg and chili powder. Simmer for 5 minutes or until desired thickness is achieved. Pour into mugs and top with toppings of choice.